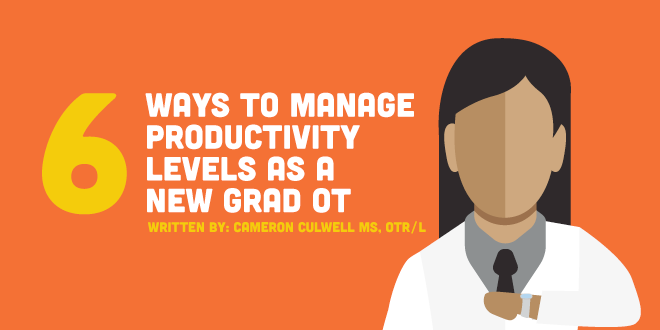 Hospitals, home health, and skilled nursing facilities are all settings with difficult productivity levels for new grad OTs. The good news is, although managing productivity can be a challenge, it is certainly not impossible. I have listed 6 ways that help me manage productivity in healthcare. In many settings, occupational therapists use a bag to carry their treatment tools. They want to save themselves time from having to go back and forth to the gym and/or supply closet to get what they need. It’s a good idea to get an organizer for your bag or buy a bag with multiple compartments so that you can easily reach your tools. I created a bag with multiple compartments specifically for this reason (shameless plug, I know). You can check it out here. This point cannot be emphasized enough. When you save all of your documentation for the end of the day, it can be stressful, overwhelming, and decrease your productivity. When you document throughout the day, you can better recall what you did with each client and how they performed because it is fresh in your mind. This will help you to document more efficiently and give you more time to spend with your clients. If you must wait until the end of the day to complete documentation, make sure you document in a quiet area if possible, or put on your headphones as to avoid distractions. 3) Put your phone away! We LOVE our cell phones and all of the apps that come with it. They are also very much needed during the work day to contact colleagues, look up equipment pricing for clients, etc. However, it definitely causes trouble in terms of productivity from time to time. It is best when you are documenting, to either turn your cell phone off or put it into airplane mode. If there is anything you get out of this article, let this be it. Planning your week ahead of time, either on Friday afternoon, over the weekend, or on Monday morning, is HIGHLY important. This can and will save you so much time. This is something NGOT has talked about before. Ask in your interview and get set up with a senior therapist. They will do the best they can, but remember they are busy too! Know what mentorship you need and advocate for yourself. If you aren't getting enough attention, seek out a mentor yourself. This person is someone who has more experience and you are comfortable asking questions too. Together, sit down and chat about expectations, needs, and how often you want to meet. Not only is this helpful for treatment planning, but it can also help you tackle your productivity and time management problem. Most of us became occupational therapists because we care and we want to help people. We want to go above and beyond for our clients and employer. There is absolutely nothing wrong with that, but you must be careful that it is not affecting you in a negative way. Setting boundaries could mean setting a time limit for questions with your client and their family members. It could also mean asking your supervisor for a meeting instead of having him/her bombard with questions/concerns on the spot. It could also be asking one of your colleagues to talk to you about something during lunch or after work instead of during documentation time. All of the scenarios listed can be done respectively and assertively and will definitely help you remain more productive and prevent burnout in your setting.